In the front row are Scott Anderson, Griffin Talbott and Matt Hayes. In the back row are Donna Eastham, Pam Nibert, Dr. Ron Area and Rick Robinson. 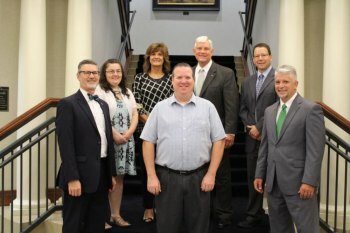 HUNTINGTON, W.Va. - The Marshall University Foundation recognized eight employees and one volunteer for reaching milestone years of service at its annual service awards luncheon June 28. Deb Hicks celebrated 50 years of combined service at Marshall University and the foundation. Pam Nibert, executive assistant and human resources coordinator, was recognized for 20 years of service with the Marshall University Foundation. Recognized for 10 years of service were Scott Anderson, chief financial officer; Dr. Ron Area, chief executive officer; Rick Robinson, senior director of development and Griffin Talbott, program director of the annual fund. Matt Hayes, executive director of alumni relations, and Donna Eastham, accountant II, were recognized for five years of service. Beth Area was recognized for 10 years of volunteer leadership. The Marshall University Foundation was established in 1947. Over the past 70 years, the foundation’s staff has grown to 28 employees and two volunteers. The Foundation Hall opened in 2010 and in the fall of 2015, was renamed the Brad D. Smith Foundation Hall after Marshall alumnus and benefactor Brad D. Smith.